We now have confirmation that the subway opened in 1938. This information came from a sale on Ebay of a press photograph of the opening. The date is in US format but appears to be 19th April 1938. Our thanks to David Goodliff, who purchased the photo, for permission to reproduce it here! 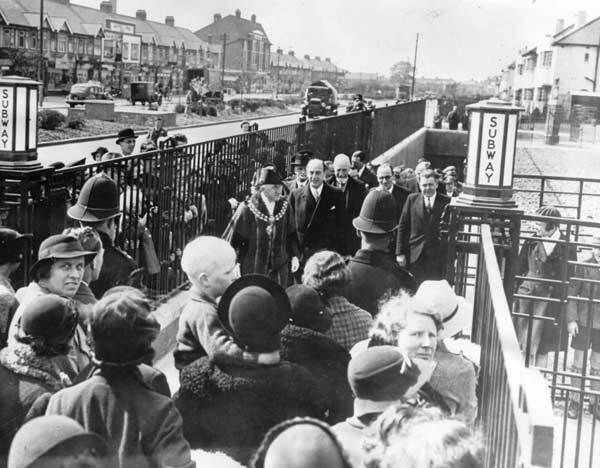 The new subway at Newbury Park, Essex, which is to carry pedestrians and schoolchildren beneath the Southend Arterial Road was opened by Dr Leslie Burgin, the Minister of Transport. The Subway, which it has taken six months to build has cost £7000, exclusive of land. First of its kind in England, it is likely to be the forerunner of others in other parts of England. The picture shows Dr Burgin walking through the subway with the Mayor of Ilford, J Elborne, after the opening ceremony. 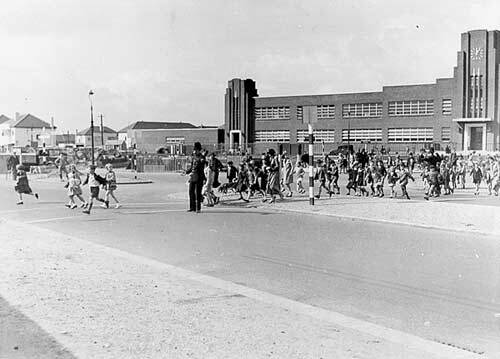 The other suggestion is that the children were all being let out of school for a royal visit so a "mass" crossing was organised (it was nearly lunchtime according to the school clock). Does anyone know of a royal visit around 1938? One of our contacts recalls using the subway with his big brother when he went to school. There was a plaque under there once - long since gone. He was frightened of going under the subway for it seemed dark. During the war it was used as an air raid shelter. There were two-tier bunks down each side. Sacking hung at each end to keep out the draught. His brother would run on ahead of him - and through the subway, leaving him to run the gauntlet of the bunks alone. There were people sleeping in the bunks some mornings. 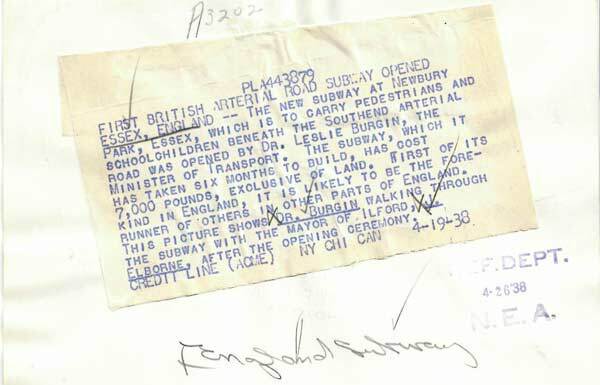 Further info: 12/04/02 - Brenda Graisgour (and others) phoned the The Ilford Library Local Studies/History Department and they said that the subway must have been built after the war, between 1945 and 1948. They had found this info from looking up the minutes of council meetings but are going to try to see if they can find anything more definite. Further info: 01/05/02 - While Geoff Gillon was doing some "Torbitt Research" in Oaks Lane he came across a gentleman who said that his wife was one of the very first pupils at the school - Iris McCarthy. At the time she lived over Bill Bailey's greengrocery on Silverdale parade. It turns out she was in Ron Jeffries' class and, wait for it.............. she was one of the occupants of the subway on the bunks during the air raids! Geoff didn't actually get to talk to Iris, so we are no nearer to discovering when it was actually completed and opened to public use for the purpose for which it was designed. I do remember the subway. I am quite sure that when we commenced in September 1937 it had not been built because I can remember being escorted across each carriageway of the Eastern Avenue. It must have been completed during that first year because there was a very bad accident when a child went down it on his bike, lost control and I believe also lost his life. There would probably have been something in the Ilford Recorder at the time. Copies are kept at Ilford Library I believe. Wiggings and serious talks from Mr. Train were given in Assembly. I think I also remember wiggings about our behaviour with the crossing keeper. The subway had bunk beds in during the war and folk slept down there at night to shelter from the bombs as they did in tube tunnels also. I do remember the subway being flooded, and I seem to think that I saw a picture of the flooding in a local paper. Also I now recall how we used to go down the slope on our roller skates, two of us would go down together on what we used to call a boat, a boat is two people facing each other, sitting on one of the other persons foot and holding arms round each others shoulders, the other leg was used for balance, we used to see who could start off highest up the slope without coming a cropper when you had to turn into the tunnel at the bottom, I limped home many a time, and I still have the scars. I can remember having to run the gauntlet of the bunks in the subway when men lying in the bunks would reach out and try to lift up your skirt. Also, when it was flooded, we used to go down and float off the rail at the side of the slope, very unhygienic I would have thought. 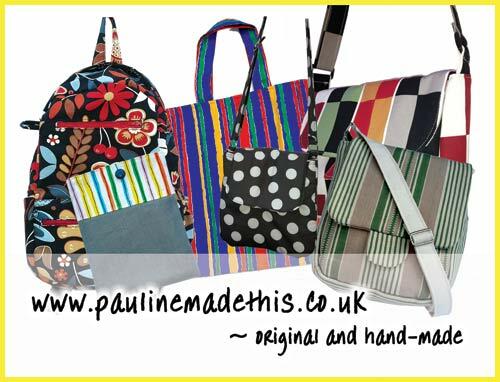 I used to get a real ticking off when I got home with full wellies and wet skirt. Memory from Billy Dodds - 17/10/02 - The subway was in use for pupils pre-war, but his recollection is that it wasn't actually ready for when the school opened in 1937 - hence policeman were provided to control the crossing. He seems to recall them being there twice each day though. He believes the subway came into use in 1938 so the photo, thought to be 1938 may have been taken to 'celebrate' the end of the need for police there. During the war the bunks for air raid purposes were three high; there was a chemical toilet at each end. He himself sheltered there. The entrances were enclosed by sacking curtains. He thinks the mirrors were always there- certainly he was one of the children who would squeeze down and hide behide them and frighten users when they approached! At the top of the slopes, there were concertina gates and he says the pintle cast into the foundation for these can still be seen at one entrance. Shirley Bowl (later Shirley Headley, Mayoress 1954/55) - The subway opened in 1938 and she was the first pupil to walk through it. She presented the then Lady Mayoress with flowers in the school hall afterwords.